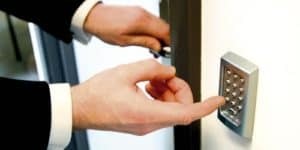 What Are Paxton Access Control Systems and For Whom Are They Suitable? Paxton Access Control Systems act as a standalone solution where all control electronics are inside the keypad or reader. Compact Paxton Access Control Systems are easy-to-administer and they are a cost-effective means of controlling access to a building. However, the control electronics are all housed in the reader or keypad. Therefore, this type of system is not recommended for exterior or high-security interior doors. Compact systems are available in a choice of TOUCHLOCK keypads, PROXIMITY readers or CARDLOCK (magstripe) readers. Access is gained by using a code or PIN with a keypad, or by presenting a valid token to readers. We provide a simple token management solution with our token packs. This, in turn, makes administration straightforward. Do you think you or your Maidstone, Medway or Kent business and premises could benefit from a Paxton Access Control system? If so, please do not hesitate to Get In Touch today and one of our expert team will be happy to help. We look forward to hearing from you and helping your business.